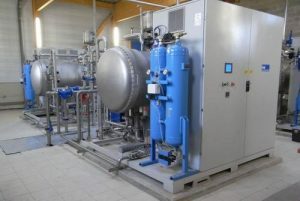 Water Treatment – Ozone is used for reduction of organics in water as an initial oxidizer, micro-flocculant and as a post-treatment disinfectant. Systems can be very large as found in water treatment systems at the City of Montreal, Dallas and Los Angeles or sized for individual households. For reduction of Trihalomethane residual in the pre-treatment phase ozone is used to oxidize organics and as a micro-flocculant prior to chemical and coagulant treatment. This reduces the organics in the water and the resulting treated water THM levels are lowered. It was found that COD and TOC can be removed effectively by ozonation. At 0.78 mg O3/mg COT and 0.088 H2O2/O3, about 94% COD and 38% TOC were eliminated in 30 min; at 1.35 mg O3/mg COT and 0.04 H2O2/O3, about 88% COD and 68% COT were eliminated in 30 min; and at 1.92 mgO3/mg COT and 0.61 H2O2/O3, about 79% COD and 75% COT were eliminated in 30 min. Odor Control – Ozone is used to oxidize organics in airstreams and to break up the long-chain molecules typically responsible for the truly penetrating odors produced in wastewater, composting, cooking and chemical processes. Ozone breaks down odorous substances to their “base” non-odorous components. Because Ozone is an Oxygen-based oxidizer, unlike chemical oxidizers, the oxidation byproducts are components of whatever was in the airstream and oxygen. As such, Ozone, as an oxygen-based oxidizer does not contribute chemical byproducts. Environmental Protection – in-situ remediation of organic-contaminated groundwater and soil have been successfully carried out with Ozone. Ozone can be introduced to the subsurface water as either a gas (ozone sparging) or a liquid (dissolved ozone injection). In its gas phase, ozone is typically introduced to the subsurface water through traditional air sparge wells. In its liquid phase, ozone dissolved in water is typically injected to the subsurface through injection wells, trenches or infiltration galleries. When ozone is dissolved in groundwater, the groundwater itself becomes a remediation agent. Food Industries – Ozone has enjoyed a long history of use and is known as a broad-spectrum biocide against viruses, bacteria, biofilms, fungi and protozoa— none of which can build up a resistive tolerance to ozone, because ozone disinfects by oxidation processes. Ozone does not act as a systemic poison to microorganisms, but rather, destroys them by oxidation. Consequently, it is impossible for a microorganism to build up any resistance to oxidation. Today, ozone technology is beginning to be used effectively as an additional point of intervention in the food and beverage industry. Chlorine Free Technologies – Ozone can be used to eliminate or reduce the use of chemical oxidizers. In swimming pools for example, ozone systems can be used as the main oxidizer/sanitizer or it can clean up after the chemical oxidization of chlorine significantly reduce the chloro-organic byproducts from the pool water. Many of these byproducts are known carcinogens such as Trihalomethanes and many others haven’t even been evaluated for their risk potential.